Fairgrieve Elementary student show their excitement upon being named as an expectation expert for the month of November. Standing alongside them is Principal Jean Sampsell, top right. 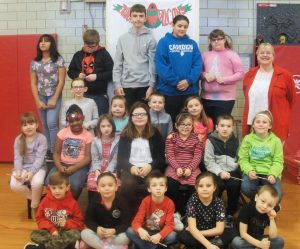 Fairgrieve Elementary School Principal Jean Sampsell recently honored several students because they exceeded expectations throughout the month of November. 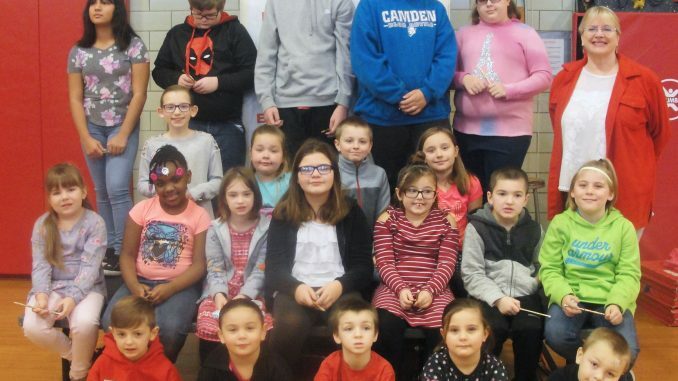 During a recent Morning Express program, one student from each classroom received applause, cheers and support from Principal Sampsell, their peers, guests and their teachers who nominated them after they witnessed their outstanding behavior. For their efforts, they received a commemorative pencil to add to their collection from Principal Sampsell. Honorees in the front row, from left, are: Parker Hall, Adelyn Adkins, Marshall LaBaff, Bella Bellavina and Johnathan Bury. In the second row, from left, are: Avery Tice, Catori Spencer, Tawnee Burns, Melanie RIchway, Jasmine Paro, Ethan Hatter and Mackenna Myers. In the third row, from left, are: Casandra Guillaume, Gabrella Gardner, Parker Killmeyer and Alivia Exelby. In the fourth row, from left, are: Shyla Alvarado, Johnathan Hutchins, Corbin Cross, Kyleigh Sweeting, Hannah Bell and Principal Sampsell. Absent are Jayden LaGrow and Jayante Ramacus.